Sister Sharon of the Sacred Heart, from Elmhurst, NY; and Sister Malia Makalita, also from Tonga. 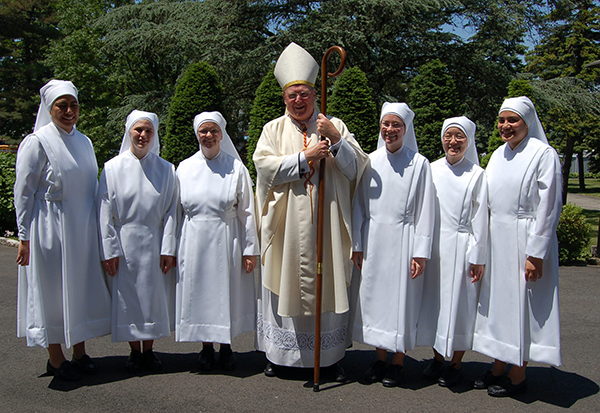 “You are the heartbeat of the Sacred Heart of Jesus!” This is how Cardinal Timothy Dolan, archbishop of New York, described the six young women before him who were about to make first vows as Little Sisters of the Poor. Cardinal Dolan presided at the Mass of Religious Profession at St. Ann’s Novitiate, Queens Village, NY, on Saturday, June 1. He was keeping a promise he had made to one of them – Sister Elizabeth Mary de la Croix – when he met her in St. Patrick’s Cathedral shortly before her entrance into the Congregation. When he learned that she was originally from his home parish in Baldwin, MO, and had gone to Holy Infant Grade School, just as he did, he vowed to be present if and when she made first vows. And so, about three years later, he arrived at the doorstep of the novitiate with Sister Mary Rosario, RSM, principal of Holy Infant, and his priest secretary, Rev. James Cruz. In his homily, Cardinal Dolan reminded the six novices that they were dedicating themselves to being the heartbeat of Jesus, tenderness incarnate, in treating God’s people: first of all in receiving his love for them, gratefully, humbly, every day – and then in returning that love with tenderness to his people. That message seemed to strike not only the six making profession, but also the five new novices seated in the front row at Mass, and the many Little Sisters from the various Homes for the elderly run by the Little Sisters. They were there to support Sister Mairéad Regina, from Ireland; Sister Malia Cecilia and Sister Malia Makalita, from the Kingdom of Tonga; Sister Mary Gerard of the Cross, from Syracuse, NY; Sister Sharon of the Sacred Heart, from Elmhurst, NY; as well as Sister Elizabeth Mary, as they pronounced vows of chastity, poverty, obedience and a special fourth vow, hospitality. After Mass, the Cardinal and those making profession were presented with leis by the families of the Sisters from the South Pacific. The newly-professed learned their new assignments, which will take them to Little Sisters’ Homes for the aged in Dublin, Ireland; Sydney, Australia; Totowa, NJ; San Francisco and San Pedro, CA; and Pittsburgh, PA. The Little Sisters of the Poor are an international Congregation of women religious founded in 1839 by St. Jeanne Jugan, canonized by Pope Benedict XV in 2009. Together with a diverse network of collaborators, they serve the elderly poor of over 30 countries. Sister Mary Richard is responsible for formation at St. Ann’s Novitiate, Queens Village, NY. For more information about the vocation of the Little Sisters of the Poor, visit www.littlesistersofthepoor.org.